Once the beach blankets and umbrellas are put away and the fruity cocktails turn into warm hot toddy’s, the colors of summer fade to a more neutral, slightly darker palette. 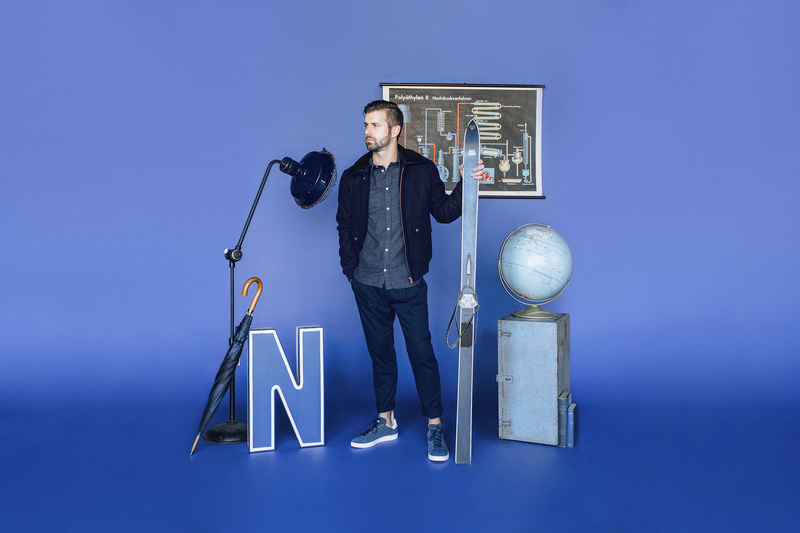 In this month’s color theory, we cling to some brightness with shades of blue from chambray to dark navy. Blue will actually make a bigger color statement than it might seem, especially when styled in a monochrome as shown here. A midnight blue tux is a great replacement for traditional black if the event permits. Blue sweaters and button downs in ice blues or deeper shades look bright yet sophisticated. And how many blue shoes do you own? Add a casual pair to your wardrobe and it will go with most anything. This look can go from the office to a nice dinner with an easy swap of a white collared shirt and pair of loafers. 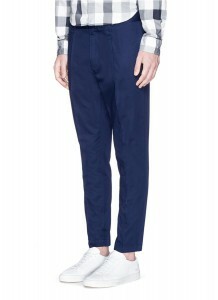 This Italian cotton pant from J. Crew is the perfect transitional pant, shorter at the ankle and with just the right amount of pleating to look sophisticated without adding too much fabric at the waist (yes, pleats are back…but be careful). 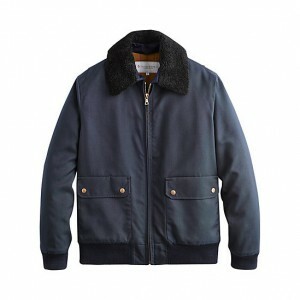 Pilot’s Bomber Jacket – Navy Melton, from Private White V.C. Navy Meton from Lancashire, England, is used for this quintessential bomber jacket. Copper zippers and snaps and a detachable fur collar are unique elements on an otherwise classic jacket style from Private White V.C. Norse Projects out of Copenhagen was founded in 2002 by Tobia Sloth, Anton Juul and Mikkel Groennebaek and became one of Northern Europe’s best street and footwear boutiques until launching an in-house brand in 2009. 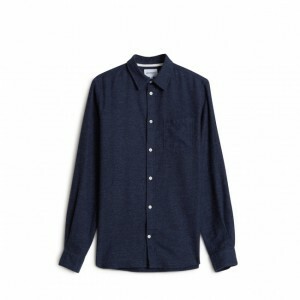 This Norse Projects Anton Brushed button-up shirt is inspired by the classic flannel with mother of pearl buttons and a one-button close patch pocket. These lightweight trousers are made from refined cotton from the Larusiani Mill in Milan and feel truly luxurious at a great price point. These are perfectly pleated and tapered right at the ankle which lends itself to pair with casual shoes as shown, or dressed up with a dark brown or even navy loafer. Yes, this is a skate shoe, but you don’t have to be comfortable on a deck to pull them off. One of the beauties of collaboration between athletes and good designers are shoes like this that are both functional and stylish. Stan Smith began designing tennis shoes in 1965, and his classic style has continued to evolve into a variety of styles and colorways.